After the Spanish conquered Mexico, some native people who remembered the days of the Aztecs wrote their own memories of Aztec history, religion and maps. We still have many of these colonial texts in our libraries and museums, like the Florentine Codex (pic 1). What were books made of? 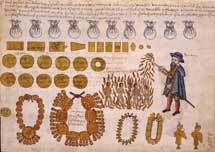 Aztec books (or ‘codices’) made before the Spanish conquest did not look like they do now. For example, their pages were often folded together like an accordion (pic 2). This type of binding is called ‘screen-fold’. They could be made from tree bark, cactus fibre and animal skins. We use the alphabet to read, but traditional Aztec books could be read through painted pictures that showed people symbols and ideas. Here (pic 3) is an example of a picture that describes a place. This is the Aztec city of Huitzilopochco. 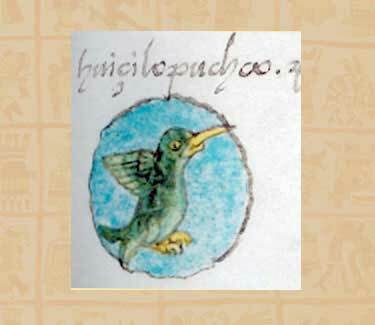 If you were an Aztec this picture would mean a hummingbird on a blue background. The colour blue reminded the Aztecs of the sun and the warrior god Huitzilopochtli, whose name was Left Hand Hummingbird. 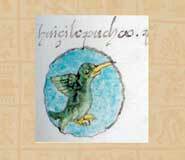 People who could read this sign would identify the humming bird and the blue background with Huitzilopochtli. Aztec books were also ‘mnemonic’, which means that their paintings were supported by songs, histories, prayers and myths that were spoken out loud. 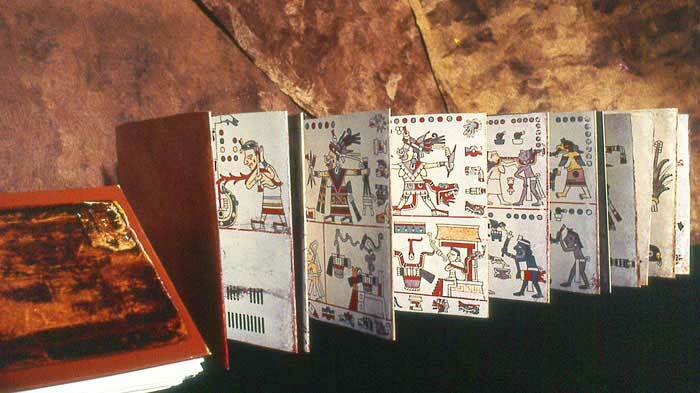 The Aztecs would tell these stories while they displayed their books at religious ceremonies or formal occasions. 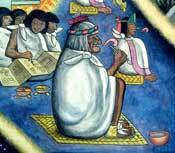 The people who painted codices were men and women who were well educated and specially trained, often members of the Aztec nobility (pic 5). Pre-Hispanic books varied in theme, but only two types remain for us to see: books which talked about religion, calendars and the gods; and histories, which focused on the actions of great leaders, and the history of their people. Colonial books were books written after the arrival of the Spanish. They covered many themes such as the bad treatment that native people received from Spanish landowners. 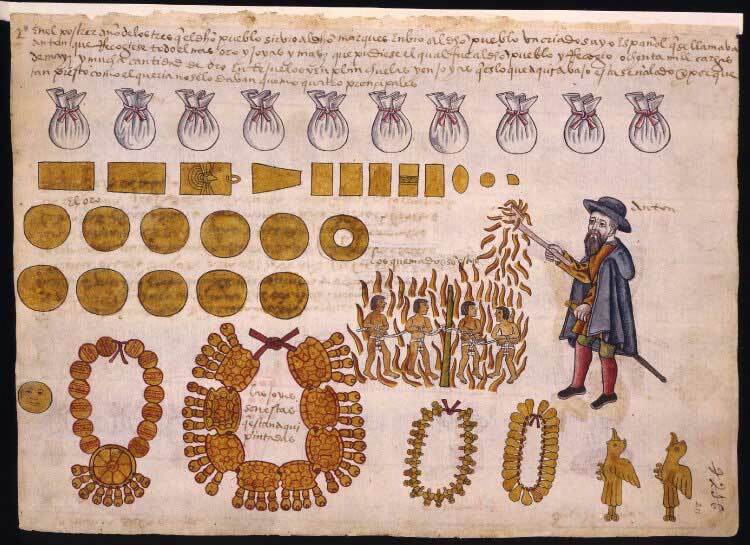 Here (pic 6) is a page from the Codex Kingsborough, a document showing the struggle between the Indians of Tepetlaoztoc and Don Velázquez de Salazar. You can see from this page that the native people experienced terrible treatment at the hands of the Spanish. Here, they are being burned alive for not delivering payment on time! Go and visit a codex! 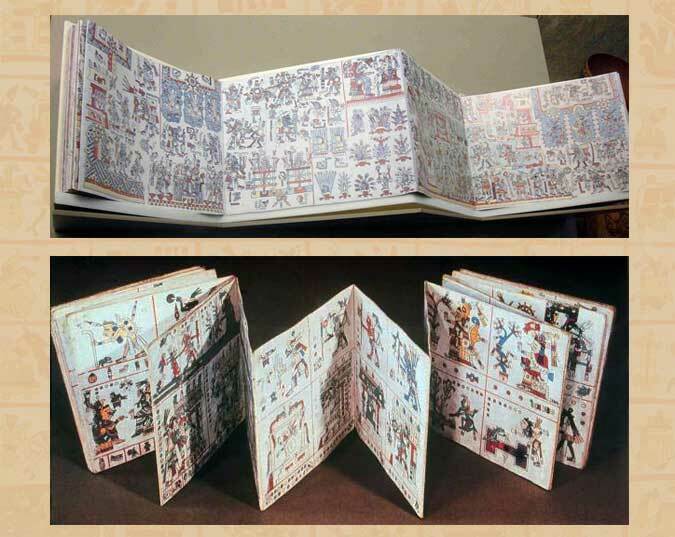 Did you know that some of the most incredible pre-Hispanic and colonial codices can be found in British Museums? 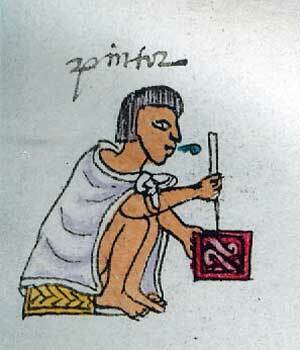 On display at the Liverpool World Museum is the Codex Fejérváry Mayer, a pre-Hispanic religious document probably painted in southwest in Mexico. Q. Why might we call a battered old Aztec book ‘DOG-eared’?